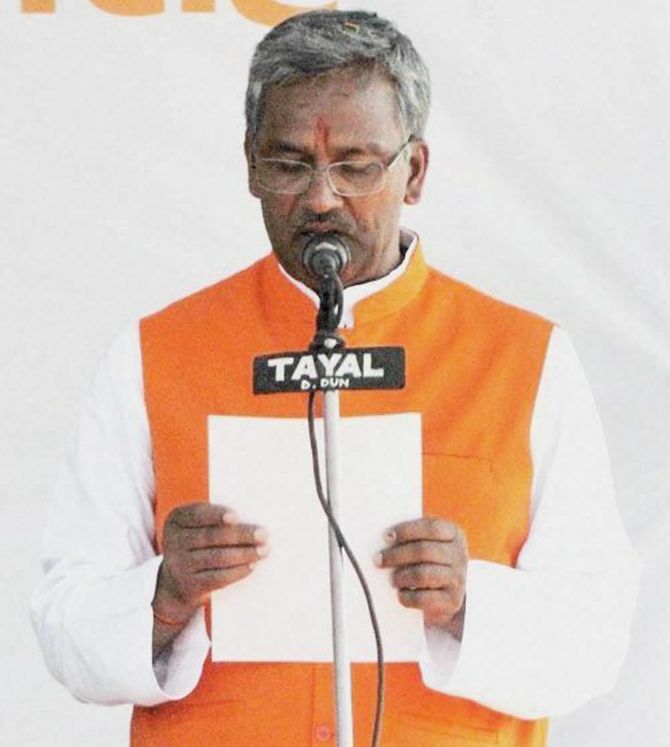 Trivendra Singh Rawat, the man with deep Rashtriya Swayamsevak Sangh roots who also enjoys the trust of the Bharatiya Janata Party brass, was on Saturday sworn in as the 9th chief minister of Uttarakhand. Nine other MLAs also took oath of office and secrecy along with Rawat as part of the two-tier ministry, which is a mix of old and new faces. 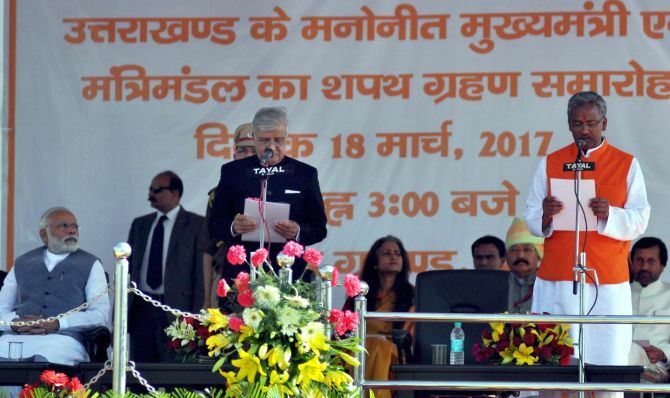 Rawat and his ministerial colleagues were administered the oath by Governor K K Paul at a ceremony which was attended among others by Prime Minister Narendra Modi, BJP president Amit Shah, Union Ministers Rajnath Singh and Uma Bharti, Haryana Chief Minister Manohar Lal Khattar, among others. Apart from Rawat, seven MLAs were sworn in as Cabinet ministers and two as ministers of state. The seven Cabinet ministers are: Satpal Maharaj, Prakash Pant, Harak Singh Rawat, Yashpal Arya, Subodh Uniyal, Madan Kaushik and Arvind Pandey. The two MoS are Dhan Singh Rawat and Rekha Arya. Five former Congress MLAs, who had defected to the BJP, were rewarded with ministerial berths. They are Subodh Uniyal, Harak Singh Rawat, Yashpal Arya, Rekha Arya and Satpal Maharaj, who was himself a contender for the top post. While the first four had defected to the BJP after a bitter fight with the previous Congress Chief Minister Harish Rawat in May last year, Maharaj had joined the saffron party soon after Rawat was made the CM. Five of those sworn in are first-time ministers, including Subodh Uniyal, Arvind Pandey, Rekha Arya, Dhan Singh Rawat and Satpal Maharaj. Yashpal Arya, Harak Singh Rawat, Prakash Pant and Madan Kaushik had been ministers in the past too. An effort to strike a regional balance was also evident in the choice of ministers, with five of them from Garhwal and four from Kumaon. Trivendra Singh Rawat, 56, was elected the leader of the BJP legislature party on Friday after the party's landslide win in the hill state on March 11. The BJP bagged 57 of the state's 70 seats, decimating the Congress. Rawat, a former RSS pracharak, was apparently rewarded for his unflinching loyalty to both the Sangh and the BJP as also his organisational skills which were put to test in Jharkhand where he came out with flying colours, guiding the the party to a resounding electoral victory in the assembly polls in 2014 as BJP in-charge. Rawat also has considerable administrative experience as he was a minister in the BJP governments led by B C Khanduri and Ramesh Pokhriyal Nishank. The party, which swept to a massive win in the hill state relying completely on Narendra Modi's magic was looking for someone who had the energy and calibre to translate the prime minister's vision of development, and many felt Rawat was the most suitable candidate. "With a huge mandate like this the party could not have taken chances. 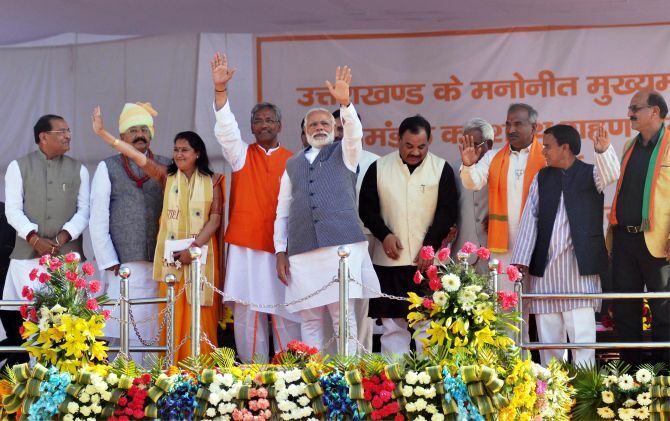 "The leadership was keen on giving the reins of power to someone who could deliver on the promises made to the people of the state by the Prime Minister and Trivendra ji, with his organisational skills and ministerial experience, fittted the bill," pradesh BJP spokesman and newly elected MLA from Vikasnagar Munna Singh Chauhan said. Elaborate stage and seating arrangements had been made at the Parade Ground for the swearing-in of Trivendra Singh Rawat and his Council of Ministers. The long podium was divided into two sections, one for oath taking and the other for seating prominent party leaders, MPs and the newly-elected state legislators. A separate podium stood at the venue where chiefs of different Hindu Akharas saints and seers wearing saffron sat to witness the ceremony.